Well, readers, I'm happy to announce another fantastic giveaway from one of my sponsors... Gussy, the lovely shop by Maggie Whitley, is the exciting sponsor behind these darling bags, and is offering my readers a $30 gift card giveaway!! Here's some info from Maggie about Gussy! 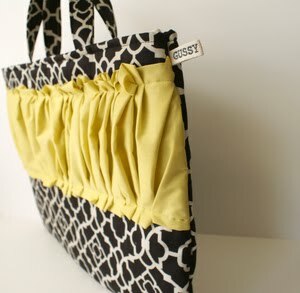 Gussy is a line of ruffled accessories. Each ruffle is machine sewn free-hand style, making each ruffle unique. About 18 months ago I sat down at my kitchen table -- I wanted to learn how to sew. And here I am now, offering zipped pouches of all sizes, laptop bags, netbook/iPad bags, tote/diaper bags, checkbook covers, wristlet/clutches and note cards (all with my signature ruffle) to those that love a little flair :) And, I've recently quit my day job to pursue Gussy full-time. To read more about Gussy, click here. The Nester wrote, "Gussy has a juicy shop full of all kinds of wonderfulness, and her blog, Gussy has a lot to say, is quickly becoming a crafter’s headquarters where she features different crafters/artists and writes about her experience." I'm so excited to share Gussy's giveaway with my readers! I will announce the winner Wednesday, July 14th... good luck and have fun browsing Gussy! I would definitely pick any patterns with trees like the zipper pouch. I've been seeing GUSSY everywhere. I'm loving it! Ooh, what a giveaway! Sweet. Oh, and I already follow you. I'm a sheep. Such cute stuff! I link to you on my blog. I love the blankets, makeup bags and headbands--- cute, cute, cute! I'm always drooling over Gussy's work! Beautiful! I particularly like the teal/green polka dot wristlet or makeup bag. Both are adorable. Fun! I love Gussy's products, I follow her blog too. And I follow yours, of course. Thanks! I can't pick---I love the makeup pouch and the smaller zippered pouch. Oh and I always love a headband! Such cute stuff! I love the purple leaf ruffle headband and the green floral headband! I love the green and yellow head band as well as the as well as the floral makeup bag! I am in love with her makeup bags, especially the orange polka-dot one (http://tiny.cc/bw9x7). Her craftmanship is amazing! I LOVE Gussy! I need one of those cute headbands she's making now! oh pretty!I love her make up pouches! tweet tweet! i tweeted about the giveaway @ohsweetjoy. ooh. love the citrus polkadot makeup bag. 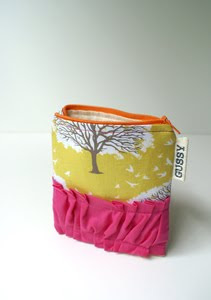 Lovely Gus - yellow tree zipped pouch! I love the teal wristlet. And the citrus polkadot makeup bag. And the purple floral zipped pouch. There are too many pretty things to pick from! I would choose a headband or two. My hair is absolutely unruly, this summer! wow so much to choose from!! maybe a small clutch or a laptop gag... or a headband... or a make up bag...oh my!! I would choose the damask tote bag! I'd pick up a few headbands. Time for a little something for myself. :) Am a follower, too. i love all the headbands. So cute!! I love Gussy! I love the Damask laptop cover! I love the color combinations! I would get one of the cute makeup bags! The pink or orange ruffled tote bag would be lovely. What great colors for the bags! I love the pink laptop bag! i love the Lovely Gus orange polka dot make-up bag! it's pretty and perfect for make-up! Love them all but I think I'd want the damask tote bag. They are beautiful. I would put the credit towards a "Damask laptop bag" BEAUTIFUL! Let's bring some Gussy to Kansas! :) I'd choose an IPhone case and some headbands. "SEW" CUTE! I'm a follower! A sewn item a day?! That's awesome!! I usually say that I want a laptop bag (which is true). But this time around I think I'll say that I also want one of the blue floral zipped pouch. It's so lovely! I love the fabric combination's. I'm not normally a fan of polkadots, but I love the polka dot make-up bags and wristlets! Great stuff! It would be hard to choose, but I think I'd get a tote or laptop bag. I'd use it on the beautiful yellow ruffle checkbook cover. It is awesome! I love Gussy! I could really use a really cute zipped pouch. Thanks for the great giveaway! I have been a follower of Gussy for a while now. She is constantly coming up with something cute with that signature ruffle. A headband would be great. So many cute things! Make up bag might be a must have. Oh they are all so cute! I think I would pick a wristlet. What a fun little pouch to talk anywhere. Pick me because it's my birthday on the 13th! 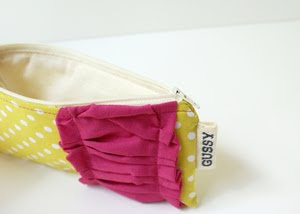 My birthday is coming up, I would love to splurge on something for myself- maybe citrus polka dot wristlet? Wowo!! I like laptop bag!! They're not like common ones, alla black and so serious...the Gussy one is colorful! i love the Ruffle Gus - green floral checkbook cover! so pretty! purple floral wristlet - oh yeah! Perhaps a ruffled headband? They are so cute! OMG I love all the cute ruffly bags!! But, I also really like the Ruffle headband in the green print. So cute!! I'd choose a Ruffle Gus as a 7th Birthday present for my daughter. She would love it. Thanks for the giveaway. I love the damask tote bag. I love all these ruffles! This give away is great! I would definetly get a wristlet. I'm going to need one for college this fall. I really love the Gussy tote: Pink Floral. How fun is that! I could tote it around in style. I would definitely get a purple floral make-up bag! Too cute! Love the makeup bags and headbands! Those are adorable! I'm loving the umbrella wristlet. That'd be perfect for the days I wear a skirt with no pockets but don't feel like toting around a huge purse. I'd choose Gus For Work - Damask laptop bag. I love the cute laptop bags! I love the polka dot wristlet...so fun! I am in desperate need of a laptop case. I have been thinking about making my own but I don't know if I can compete with how adorable these are! Oh, by the way, I love the look of her website... so adorable! I'd love the blue floral makeup bag. So darling! horray for fun crafty things! i would choose the orange polka dot wristlet. so convenient and cute! I would get the Chatty Gus - purple leaf with golden ruffle and the Ruffle headband - purple leaf. I love the laptop cases!! Everything she makes is precious! I would love a damask tote! THE DAMASK TOTE!!!! I LOVE THIS STUFF!!!! I love your items! I just learned to sew last year and have started making my own pouches and bags as well (madeofpaperandthings.etsy.com). 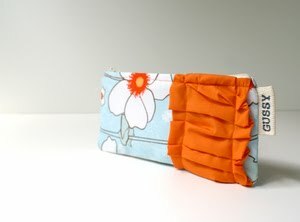 Anything ruffled goes on to my wanted list :) I especially like your blue and orange little zippered pouch. I really like the Yellow Tree print pouch. It's a beautiful design. I would get a makeup bag! The seafoam print laptop bag is darling! I LOVE the Chatty Gus - yellow tree zipped pouch! So darling! The purple leaf items are super cute--both the lovely Gus and headband!